Last week I covered condensation, this week it’s unusual sources of damp, including jackdaws! People often mistake rising damp (rises up the walls) for penetrating damp (comes through the building skin above ground level) and vice versa. Building skin means walls, roof, windows. Condensation is often mistaken for both, and can produce massive amounts of water. A domestic dehumidifier can remove ten litres of water or more a day, an astonishing amount from the atmosphere. Dehumidifiers are great little machines, and unlike ventilators won’t bring cold air in making your tenants suffer. But they shouldn’t be necessary if the building’s skin is properly waterproofed and insulated properly (see last weeks blog). ‘Rising damp’ caused by a copper water pipe in a cement floor without a plastic sleeve. The alkali in the cement caused corrosion, so a leak, not rising damp. A friend’s property suffered damp walls where his tenants piled earth against the outside walls above DPC level. This is quite common. Another friend had a ‘roof leak’ caused by his ‘cheap’ builders venting the cooker and bathroom fans directly into the loft. So no roof leak but an extreme example of condensation. It’s quite common for roofs with old fashioned non-breathable bituminous felt to have condensation issues – you can see the water droplets glistening if you shine a light on them. They can run down inside the roof and through the ceiling, fooling occupants into thinking the roof is leaking. The problem can usually be solved by unblocking eaves vents and fitting ridge vents. Several others, including the gym where I train, had ‘leaky walls’ caused by leaks in lead roof gulleys. These commonly run front to back in Bristol over the party walls (stupid idea). When they leak the walls get wet. Damp high up in walls is often caused by splashing hoppers (water collectors between gutter and downpipe). When it rains, water splashes over the walls and soaks in. A strip of lead as a shield usually solves the problem. I’ve seen this cause damp two metres down and 1.5 meters across from the point of entry, on the party wall! The usual suspect would therefore be the roof gully, but no, it was the hopper! Rain running between asbestos or slate soffits on gable end roofs is common. These hold up cement sealing the tile edges. The cement cracks letting water in. Silicone provides a solution, but it needs re-inspection every few years. Iron downpipes let into walls can corrode at the back and inject water into the wall. ‘Rising damp’ at the bottom of window frames is usually condensation caused by poor insulation, or rain blowing in around the sides and underneath the window. Easily cured with a silicone gun. Mysterious water drops can appear anywhere on ceilings and bear little relation to the original penetration point. 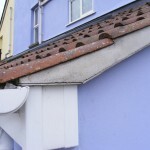 Rain can blow under tiles or slate if the roof pitch is shallow and sarking (felt) is damaged or absent. It then runs down the sarking and exits elsewhere. Next it runs along the ceiling until it finds an exit point, a light rose or plasterboard joint. Tracing it can involve some detective work in the loft with a torch when it rains. 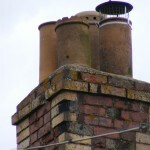 Porous chimneys often cause damp on chimney breasts and ceilings. Water gets in where plants grow in the mortar. Acid from burnt fuel also attacks mortar. Lead soakers and aprons around chimneys corrode and leak. The best thing to do with an unused chimney is take it down and get rid of it. Failing this, unused vents can be capped with cement, slate and bricks, and the chimney coated with waterproof render. Genuine penetrating damp can appear behind loose outside rendering. If you tap it with a screwdriver handle and it sounds hollow, it’s partially detached and may be providing a conduit for moisture. What about damp meters? ‘Damp Surveyors’ (i.e. salesmen) use electronic damp meters to measure damp on walls etc. They’re just as good at measuring condensation as other forms of damp, but can be pretty persuasive in the hands of the damp-man that you have a serious problem. Likewise I know an investor who uses one to persuade vendors that THEY have a serious problem. Beware! Finally, the mysterious Jackdaws. They love nesting in chimneys. When they leave the nests falls down and accumulate where the chimney steps diagonally inside. It rains and the old nests are like a sponge, holding moisture, which leaches through walls drawing brown sooty stains with it. Having the chimney cleaned and capped will stop the problem. A long blog this but there’s a lot in it… Anyone else got any unusual damp stories? Next week I’ll cover Double Glazing, and some cheaper alternatives.